The Porta-Brace WRB-3OR Wheeled Run Bag (Midnight Black) is designed for transporting all kinds of heavy loads for studio, audio, video and film equipment. The case is designed to be used for handling gear on location as well as transporting apparatus to the job site. It is constructed of a strong ridged interior frame covered with 1,000 denier Cordura nylon fabric, with padded protection all around. It has off road rubber ball bearing wheels with long axles for good tracking. It has 2 overlapping carrying handles and a suede leather end handle is provided. A set of fold down dividers is provided which allows customizing of storage compartments. 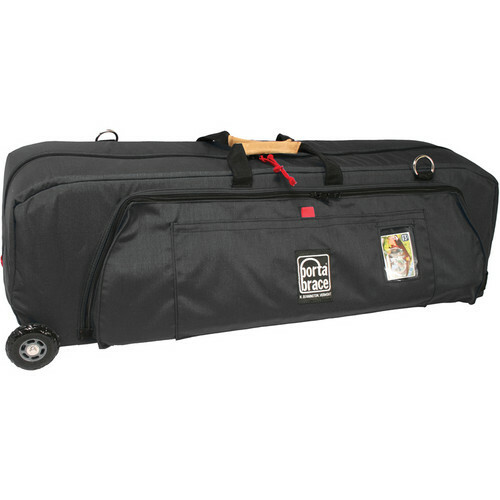 Box Dimensions (LxWxH) 40.0 x 16.0 x 12.0"
WRB-3OR Wheeled Run Bag (Midnight Black) is rated 5.0 out of 5 by 2. Rated 5 out of 5 by Doglatin from Solid gear bag for air travel This was a tough purchase - not a lot of options out there like this bag for my needs. I wanted the biggest bag allowable by airline check-in with wheels (and needs to be relatively light weight) without paying for oversize and this bag squeaks by -- technically it's too big at total 67inches (length+width+height) and most airlines say Not to exceed 62 inches (157 cm) when you total length+width+height but they approximate so you should get by (no problem so far to Tahiti and they are tough on limits). One solid week of tough field use and the wheels and axle seem solid (no hint of weakness - super strong) even when overloaded with weight on tough terrain -- so they should last -- that was the biggest concern. The size is great - fits 3 compact stands, tripod, boom pole, blimp, etc. and still leaves room for an upper compartment (1/4 to a 1/3 of the bag) to hold misc. gear. Almost waited for the Lightware RC1038 rolling stand bag (on back-order at the time) because I needed something light with wheels for the traveling, one-man-band (or one man plus sound) dslr video shoots but glad I got this. And you know porta brace is solid on material, zippers, etc. As for the weight, the Lightware is lighter so you get 6 more lbs. But I'd still have to shift things around to other bags to make airline weight limit and this covers the long items - stands, sliders, tripods, etc. and then to can stuff on location. One minor complaints is when you're wheeling the bag around it would be nice if it could stand on end (stand up tall) it balances but it's not designed for it. Rated 5 out of 5 by Solo Shooter from Great gear bag This bag holds a ton of equipment and best of all the wheels make it easy to transport. Tons of internal pockets and great external zippered pockets came in very handy. It had no trouble surviving my recent shoot in Israel (planes, buses and cars). Opens wide and zips easily. Great construction. Has anyone flown with strobe heads packed in this? Looking for an all in one in terms of lighting gear for flight. Comparing this to the Think Tank Production 40. I've got three einstein heads, some stands and a couple small soft boxes. This is a well protected and padded case. If you use it to transport lights they would be safe. The interior dimensions are 39 Long x 12 Wide x 12 High, you would just want to measure out your gear before making the purchase to make sure that is adequate space.